Despite the lack of rain over past months, there was plenty of talk about flowing water at the Peel-Harvey Drainage Mini-Symposium held on the 9th May in Mandurah. 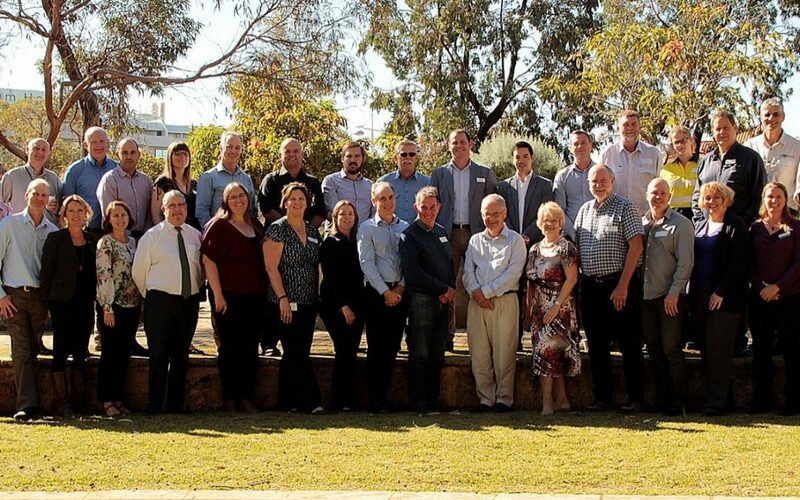 The Symposium, organised by the Peel-Harvey Catchment Council (PHCC), was convened to encourage greater collaboration between government, industry, researchers and community groups who are working on a range of projects to restore and transform the Peel Region’s rural drainage system. The system, which includes many drains dug during the Great Depression, was established to reduce the risk of flooding and excessive waterlogging to settlement and farming. The drains mean that rain falling in Byford, Pinjarra and Harvey quickly ends up in the Serpentine, Murray and Harvey Rivers and ultimately our waterways at Mandurah. Drains are like the veins that connect our catchment to the waterways and Estuary at Mandurah. ‘Rural drainage is something that we don’t often think about, but it is very important to our Region’, said Marilyn Gray, Acting Chairperson of PHCC. ‘Drainage has enabled our region to be settled, farmed and developed. However, we now know it also provides a fast-track for nutrients and pollutants to enter our waterways and Estuary, leading to algal blooms and fish kills in the lower Serpentine and Murray Rivers. ‘We need to do more to transform the region’s drainage network to ensure it not only continues to protect land from flooding, but also filters out the nutrients and pollutants in stormwater before it enters our waterways and Estuary. Restoring our drains to more natural living waterways is one effective approach. The great news is that today’s Symposium presented numerous solutions which can be implemented by government, industry, developers, landholders and the community. Drains can be transformed to trap more nutrients, hold back water for agricultural use and even restore wetlands for wildlife’ said Ms Gray. ‘We now need to implement these exciting solutions strategically across the catchment, including on farms and where land is developed for urban, commercial or industrial use’. The Symposium attendees also learnt of how drainage water is increasingly being regarded as a resource that may be able to be used in future agriculture and industry in the region. ‘Our drying climate is making all water, including water in drains, even more precious. This makes demonstrating the economic value of transforming our drainage systems a little easier’. ‘We have been heartened by the State Government’s new approach to drainage developed over the past few years and look forward to working even more closely with the Water Corporation, Department of Water and Environmental Regulation and local governments over coming years’ said Ms Gray. The one-day Symposium featured fourteen speakers on topics as varied as design of new drainage systems, tracking the flow of nutrients in drains, waterway restoration, and construction of small weirs on drains. ‘The Water Corporation was pleased to be involved in the symposium to improve drainage in the Peel-Harvey region,’ said Suzanne Brown, Water Corporation Manager for Drainage and Liveable Communities. The Symposium was made possible by the support of the Water Corporation, the Australian Government’s National Landcare Program and the City of Mandurah.